Some of the best connections are soldered connections. The problem is only one type of soldered connection is truly a joint, most are as the word states, a connection. Many solders, such as the popular 60/40, are a slurried mixture of Tin and Lead. In making the joint, the Tin/Lead mixture melts, but as it solidifies it does so one metal at a time. It goes into a slurry state where one metal is liquid and the other is very small solid particles. Next, the other metal solidifies, and creates a multitude of small connections. This type of connection is not particularly favorable or permanent. When a phone company had to use this type of solder on their main frames, every joint had to be reheated once a year to insure reliability. Even then, the "cold joint" was a common occurrence. Noisy or open joints were the main cause of failure in early printed circuit boards and electronic equipment until sometime in the mid-sixties or early seventies. Then it was learned that eutectic joints were perfectly reliable. By the mid-seventies or early eighties most electronic equipment was being soldered with Eutectic solder (63/37). The reliability of printed circuit boards went up nearly 1000%, and solid state audio gear began to sound almost tolerable. Today, all printed circuit boards use Eutectic solder. The melting point of a Eutectic solder is lower than any of its component parts, so there is no slurry state in these solders. They solidify as one creating an actual solder joint. 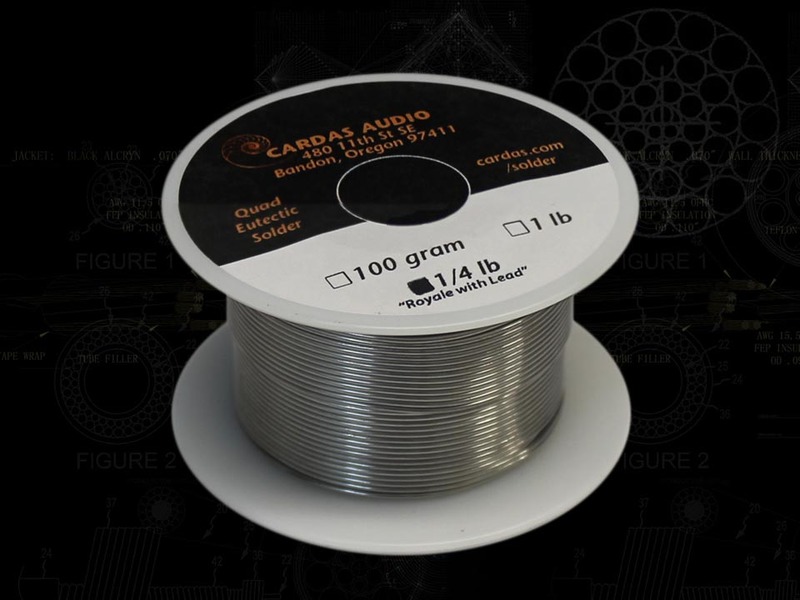 The only wires used in high-end audio are Copper and Silver, so George Cardas developed an ultra pure Tin/Lead/Silver/Copper eutectic or Quad-Eutectic solder. This solder is now used in the vast majority of all high-end cables and equipment. Properly done, Quad-Eutectic joints reliably provide the best sound with the lowest noise and contact resistance. (The above was taken in part and paraphrased entirely from George Cardas's paper Soldered vs. Crimped Connections).